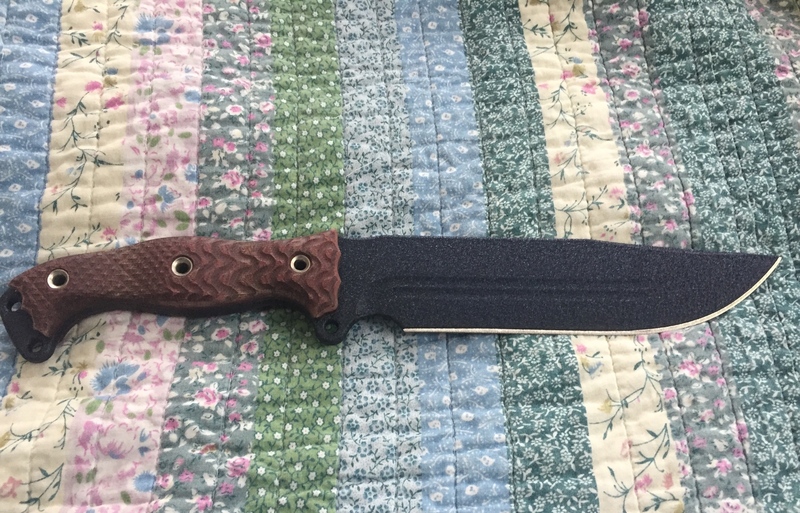 Discussion in 'Busse Combat Knives' started by Jerry Busse, Oct 20, 2018. Great pile of steel there! It's really great. Yes the handle is small, but super comfortable, almost delicate..? Not a word I typically associate with Busse. The whole package is really light as well. This may be the perfect thickness for INFI. Here are some comparison shots with other fusion handles. Left to right Nano Fusion-Forsaken Steel Heart, Nuclear Meltdown Fusion Steel Heart, Fusion Battle Huck, and CG Fusion Battle Mistress. Edit: having trouble getting the images to show up. Link should work though. will try again later. Yours looks really pointy, I like that. For some reason the pic of the nuclear competition one Jerry posted doesn’t look quite as pointy but I hope it is. Maybe it’s the angle of the pic. Anyone get shipping notices this week? Nothing here. Comp nuked micarta. Dinged a few days before Christmas. Pics... Or it didn't happen. I bet it is light. Hmm.. anyone know if there's any kydex ready yet? UPS showed up with my midnight blue coated/maroon canvas non nuked Forsaken Steel Heart yesterday afternoon. I’ve been too damned sick to even feel like playing with it, but it sure is a sweet piece of INFI! Ulf Krogstad, lex2006 and Hard Knocks like this. Dave Brown? He doesn't yet, but I ordered a sheath from him today. Mine is 18 oz. (17.98 on a digital scale) Combat Grade with canvas. back_inthe_saddle and Hard Knocks like this. How's the edge thickness on this one. Only complaint I've ever had with any of my Busse knives is geometry that's thicker than I prefer. I asked them to thin mine down a lot. We will see if they actually do it. Sense I got a Wicked edge I just don't worry about the factory edge on any knife anymore. I specially asked them to thin mine down a lot. We will see if they actually do it. That would be fantastic if they did, please let us know! My hunch is that they won't since that would be more of a custom shop request, it would also add a lot labor cost. The WE is a fantastic sharpening system! My only complaint is that it can take forever if you want to change the geometry any at all; once you put in the effort once on a knife though, it's gravy from that point on. Fortunately, most of the Busse's that I have gotten lately have been pretty sharp from factory. The exception is the daggers (FMV8 and FMV14) that I received, they were barely sharp enough to slice butter, and even then only if the butter was warm. If anybody who has gotten one of these and also owns a large Spec Ops Brand sheath, could you see if this will fit? I wish there was more of a consistency with the sharpness. A few flak jacks I got were screaming sharp. I was pleasantly surprised. Most of the ones I get aren’t very sharp and a few have been down right dull. From the names I get on the cardboard it seems like Beef was one of the better people sharpening the blades. zmbhntr and bikerector like this.